Do you occasionally forget to floss after shower? Does your traditional water flosser clutter your bathroom counter? Do you sometimes run out of time because you have to clean your teeth after shower? If yes, then the shower floss could be the solution for you! In this shower floss review we’ll be reviewing the immaculate Waterpik WP-480w Showerpik (note: this review is mostly based on the amazing 70+ Amazon consumers who bought this product). 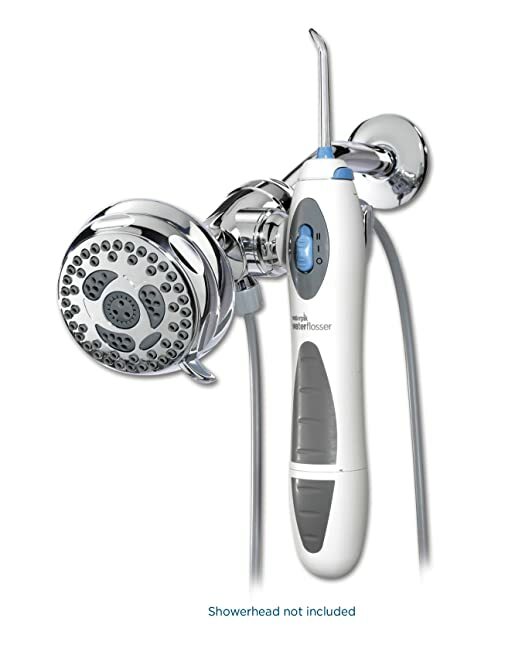 The Waterpik WP-480 will grant you all the privileges of a water flosser right under your shower head while you busy showering. Imagine how much time you’ll save killing to birds with one stone! Just like traditional oral irrigators, the showerfloss combines water pressure and pulsation to massage and stimulate gums, eliminate plaque and bacteria buried between teeth and below the gumline, that’s something you can never achieve from normal brushing! Like all Waterpick flossers, it has been clinically proven to reduce plaque, givintis and gum disease. This is the total rating of this product. Let’s explain the benefits listed above of this shower water flosser a bit, I excluded the obvious – it’s water proof! Looking for an alternative shower flosser? Check out the affordable highly rated Shower Breeze review from Oral Breeze. The Waterpik WP-480w showerpik is very easy to install, most DIY-ers will not need to hire a plumber and most reviewers on Amazon achieved it in less than 15min. It comes with a Chrome 2-Way Shower Diverter which you can easily assemble into your existing shower head (it works with both Fixed Mount Or Hand-Held). The only extra tool you will need is an adjustable wrench, everything else in included. Note: Check installation video at the bottom of the article. Unlike traditional water flossers which you sometimes have to refill the reservoir often, the showerpick’s water source is your shower’s main source. So, you’ll never run out of water. Because of the 2-Way Shower Diverter, you have the ability to use your shower only and not the showerfloss, or if you like, use both the shower and the Waterpik WP-480w Showerpik. Fortunately you won’t be running back and forth to a store every other week to buy batteries. This shower floss is rechargeable. Reviewers on Amazon stated that the battery lasts approximately 4 – 7 days after each full charge. Off course, this will also depend on how often or how many users are using it. A cap which prevents the tip from coming into contact with soaps or any other non-hygienic material is included in the pack (check image below). You can easily set pressure speed between low and high. It is recommended you use the low setting for the first time, then gradually increase to high with time. One of the issues owners of normal water flossers come across is noise, clutter and mess. Because this flosser is installed in your shower, you’ll have all the space you need on your counter top. The fact that you’re in a shower eliminates the possibilities of noise. The water spilt which seems to be unavoidable with traditional flossers, will not be a problem with a shower water flosser! You’re already in a shower, remember? No product is perfect, so let’s see the cons that come with this shower floss. The biggest and probably the only real con of this product is the connector-piece (2 way diverter) being plastic! Which is not expected for a product of its calibre. A lot of people are concerned about the “plastic’s” durability and life span. While another Amazon reviewer said his shower setup consists of good looking brushed steel, and now this plastic spoils the whole design. I believe a water flosser should at the least come with 4 tips. If you have a large family, you will be forced to purchase additional tips (available on Amazon) for each member. One more issue, there’s no bracket to hang the second tip, hence it will easy catch germs, soap or worse, get missing. This showerpik also does not have a battery status indicator. So there’s no way to tell if the battery is about to die until, well … it dies! As you can see, the showerfloss does not have lot of negatives, no wonder it received 4 stars out of 5 rating on Amazon. These are small complaints considering all the positive solutions it offers! This pack comes with a two-year warranty, an instruction manual, installation instructions and a quick start guide.